I have nearly finished building an Animodule SHNoize, I decided to do it because although I have a Brainseed and some other modules that dabble in it, I wanted a more traditional sample and hold module to play with - I've never really played with it. I got excited last night with the idea of putting audio rate stuff through it with a high frequency pulse to get a bit crushing effect - something I like doing at the moment is running an oscillator > spring > distortion > VCA chain - I think S&H somewhere in that could be fun! What do you do with S&H? A S&H outputs staircase waveshapes. -With noise as input, you get random values at its output. -When you use a wave at the input, the frequency ratios of the sampling frequency and input wave become important. When they are at a fixed ratio, you can get a recognizable pattern at the output. -If you input a triangle, you get voltages with equal distribution across the range of the triangle. -If you change the triangle for a sine wave, your output voltage distribution moves more towards the maximum and minimum values of the amplitude of the input wave. Clipping the sine moves the distribution even further. And with a square wave you only get maximum and minimum values. Change the pulse with to change how often you want the maximum or minimum values. -Patching audio to the input and then sampling at higher frequencies gives you samplerate reduction. Try using it to generate triggers/gates as a kind of random clock divider. Then - this comes to mind right now - use that divided clock to sample a CV sequence to generate sustained notes or whatever. Basically you can do a load of things. I often sample a faster moving sequence to create harmony lines derived the original sequence. The lead & bass on this piece were done with a combination of slew and S&H from Sport Modulator. 8 note sequences get boring fast. So what I do is use the sequencer clock to trigger the S&H and use an other clock for the sequencer. Now the S&H outputs voltages at the same rate as the sequencer did to make it fit in the tempo of the song. Patch the sequencer output into the S&H and fiddle with the clock of the sequencer. 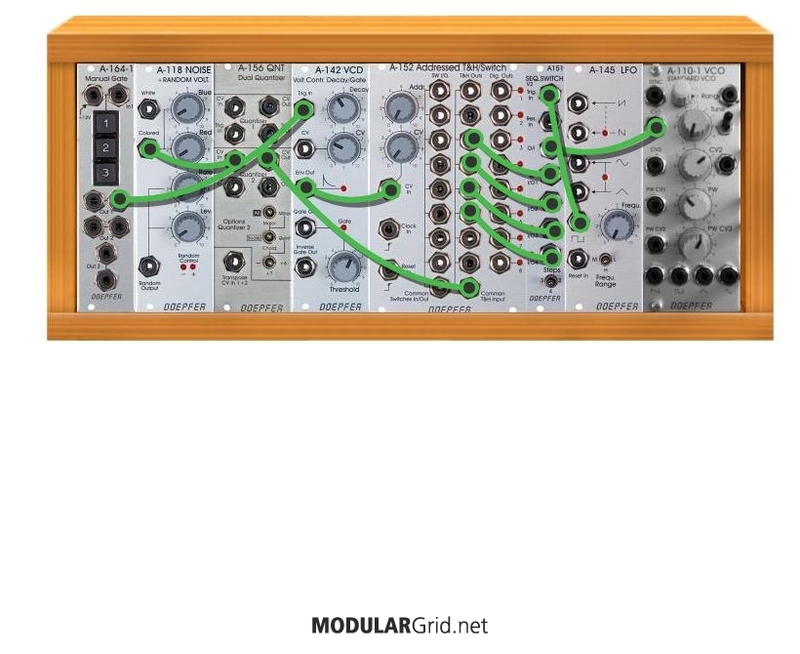 Now you can get lots of variations of your sequence simply by adjusting the sequencer clock. You can use the S&H output to CV your sequencer clock for complex but predictable results. The outputs of a sequencer into the S&H clocked by the gate output of the sequencer. This prevents cv's from changing when you don't have a gate high. If you have an adsr with cv control and you have a lfo into the cv inputs of your adsr, then the adsr settings go to minimum fast. So I have a S&H before the cv inputs of the cv-adsr. Actually its build into my RHD dual envelope. Since no analogue S&H can hold a voltage without drooping over time, you can use this imperfection to generate a slowly changing voltage. Use the s&h to sample an LFO which feeds into a sequencer variable (i.e. a Metropolis aux input). LFO > s&h > comparator for rhythmic clock lurve. FM a square wave LFO to make an LFO whose frequency varies. Send the square wave to the trigger in of the S&H. Send a noise signal into the sample in of the S&H. Send the output of the S&H to a triangle wave oscillator 1V/Oct in, and run it through a VCA. Use the square wave to also trigger an AD envelope and send the output to the VCA CV in. For good fast-slow semi-chaotic FM signals, I like to have a sine out of one oscillator FM another oscillator, which has a sine out FM'ing the latter oscillator. Feedback FM. Try sending the square wave out of the second oscillator into the trigger in of the S&H. I like to make the sound of 60's/70's TV and Movie super computers and slowely increase the clock rate so it sounds like it's gonna blow! Modulator in an FM chain gives you some nice timbre changes. I like (very) subtle S/H to osc 2 in 2-osc patches for random detuning. a-152: random/noise->quantizer->a-152 common t&h in triggered with decay envelope. t&h Outs read out with another Switch. Switch out -> vco pitch. always when the envelope strikes you get a different set of quantized voltages. with the second Switch you can Play arpeggio style riffs. S&H is probably the #1 thing I didn't realize I'd love so much before I got into modular. My main use is to sync all sorts of modulation to the clock, or better yet, to a divided clock, or step sequence. You can do some interesting poly-rhythm stuff this way. This can also be helpful when trying to modulate envelope times so that they "stick" until the next trigger. Another good use is to sample a pulse wave LFO (again with clock, divided clock, step sequence, etc.) and use that as a CV input to a VCA to periodically, synchronously, gate other CV, audio, even other clocks or sequences in your patch. PWM and FM add more fun to this. Instead of gating, you can use the same technique with a narrow pulse width to add periodic "accents" that are based on the frequency of your LFO instead of a fixed number of clocks (e.g. with a step sequencer). I was actually using track and hold! My apologies. A cool effect nevertheless. anyone got some ideas for what to do with a track and hold? Another cool thing is to clock a sample/hold with the gate output of either a keyboard (for manual playing) or a sequencer. Route the S/H output to a filter cutoff, or maybe an oscillator in an oscillator sync patch. This way you get a nice timbral shift with every new note that is played.